Pacific West levels 7-10 started the competition season traveling to Portland, Ore., in early January for the National Judges Cup. In Portland, Kaylei (level 7) won the all around, beam and floor titles in the junior A division. Lauren (level 7) placed 1st on vault, 2nd on floor and all-around and 3rd on beam in the junior B division. In the senior B division, Charvi won floor and all-around and placed 2nd on vault and bars. In the next session, Tia (level 9) placed 1st on bars and 3rd all-around. In the level 8 session, Taarika placed 3rd on floor. Cortney, Emma and Shyan represented Pacific West in the level 10 session, with Cortney placing 3rd on bars, Emma placing 3rd on vault and Shyan taking 3rd place on beam. 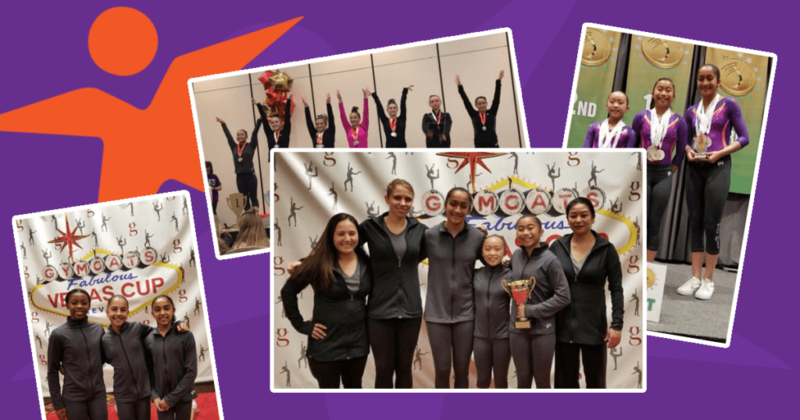 Two weeks later, the team traveled to Las Vegas, Nev., to compete in the GymCats Vegas Cup. The level 7s started off with a great competition, winning 2nd place team. Lauren claimed the junior all-around, vault and bars titles while Kaylei placed first on beam with a career-high score of 9.8. Charvi placed 1st on vault in the senior division. The level 8s and 9s followed up with a strong performance as well. Taarika (level 8) placed 2nd on vault, bars, and 3rd on floor. Natalia (level 8) placed 3rd on beam while Kendal (level 8) finished 3rd on vault. In level 9, Tia once again won the bars title and this time took 1st place all-around and 2nd on vault and beam. Kenna finished 2nd on vault, bars and all-around. Congratulations to all of our gymnasts on a great start to the season! ← Free Trial Class Plus Free T-Shirt!